Another happy day for us here at InterAnalysis having received this picture of Flaviano Testa. 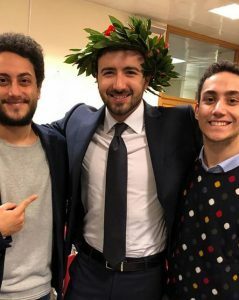 Flaviano graduated yesterday with his Master’s Degree in Economics from the University of Salerno. Earlier this year, Flaviano joined us for six months through the Erasmus programme as a TradeSift data analyst. We are sincerely grateful for his hard work and dedication during his time with us. We wish you every success in your exciting global career. Stay in touch!